Jan McDonald specialises in environmental law, with particular expertise in the legal and policy dimensions of climate change adaptation. 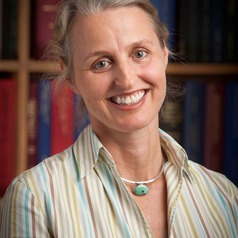 Before coming to Tasmania in 2010, Jan was Director of the Griffith Climate Change Response Program and Professor of Environmental Law and Policy in the Griffith School of Environment. In 2007, she led Griffith University’s successful bid to host the National Climate Change Adaptation Research Facility and served as NCCARF Establishment Director in 2007-2008. She also led Griffith University’s role the South East Queensland Climate Adaptation Research Intitiative (SEQ-CARI) - a partnership between the Queensland and Australian Governments, the CSIRO Climate Adaptation National Research Flagship, Griffith University, University of the Sunshine Coast and University of Queensland which aimed to provide research knowledge to enable the SEQ region to adapt and prepare for the impacts of climate change. Jan has consulted to local, state and national governments on environmental and climate change adaptation issues and has worked closely with Clarence Council to identify the legal issues arising from various adaptation options. In 2004-2005, Jan served as Environment Program Manager for the United Nations Development Program’s Pacific office, in Solomon Islands and has served as a consultant to the Government of Vanuatu and Solomon Islands, as well as several environmental non-government organizations. Since her arrival in Tasmania and the Faculty of Law in 2011, Jan has won three competitive grants relating to climate change adaptation and has recently been appointed to the Tasmanian Climate Action Council. Her current research spans the legal and policy dimensions of climate change adaptation, including urban planning and coastal management, liability and insurance issues.